Boxing fans in the Philippines have just got their New Year's celebration even better as ABS CBN S+A and Sky Cable PPV will air LIVE the WBO Super Flyweight World Title rumble between Filipino three-division champion Donnie Nietes and Japanese star fighter and champion in three weight classes Kazuto Ioka on December 31 from the plush Wynn Palace Cotai in the awesome Asian City of Macao. The Nietes vs Ioka broadcast from Macao will air live on Sky Cable PPV, starting at 6:30 PM. Price is 99 pesos. The ABS CBN S+A telecast will start with a slight delay. To order the Nietes-Ioka fight on Sky Cable PPV just call Sky Cable sales hotline (02) 418 0000. But if you miss the action (hope not), then two replays of the Nietes-Ioka clash will air on ABS CBN on New Year's Day January 1. The first replay will be January 1 at 12 noon. The second replay will be the same day January 1 at 7 pm. 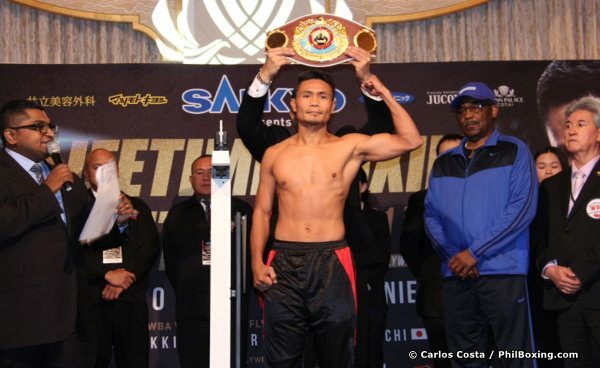 Good luck Donnie Nietes. Fans, enjoy the action, and Happy New Year..! !